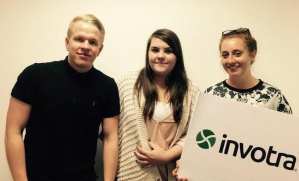 We’re so proud that our Apprentices are part of a group of trail blazers! We’ve always been proud of them, but now we are SUPER proud, prouder than Mr Proud from Proud world. Why? Because they will have their day and be recognised in front of family and friends like all other academic students. No longer will ‘Apprenticeships’, look like the ‘Degrees’ slightly down trodden relative! Our Apprentices will be part of a new ‘Graduation’ process. The Invotra graduate’s will join other apprentices in Surrey at this exciting, high profile event on the 24th June 2015. They will be able to take one guest and will be wearing the gown and posing with the scroll, as you would expect. Allie Galvin, Invotra HR says ‘This is great recognition of their dedication and hard work’. Chelsea Cadd – Test Lead, joined Invotra 2013. Currently working HMRC. Jamie and Chelsea have both finished and been working on some of our most important projects. Emily Hirth – Project Manager (L4), joined Invotra July 2013. Currently working on HMRC. We’ve always been dedicated to developing talent within Invotra and for the last few years, we have been working with QA Apprenticeships, London. They’ve been consistent in finding excellent recruits and supporting them through their qualifications. They hold the accolade of being the first IT apprenticeships business rated by Ofsted ‘Outstanding’ in all areas. They are also the three-time winners of Apprenticeship Programme of the Year 2012, 2013 & 2014. Emily, Jamie and Chelsea follow where others have been before at Invotra. We can now account for a third of our workforce having come from Apprenticeship schemes. And it doesn’t stop there…We’re currently in the process of recruiting two new apprentices, one for sales and the other for marketing. So, with any luck in a few years time we’ll be blogging about their graduation too.